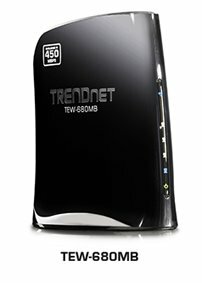 TRENDnet announced the TEW-680MB, a 450Mbps dual-band Wireless N media bridge. This product will be available in late Fall 2011. TRENDnet, a best-in-class wired and wireless networking hardware brand, today from COMPUTEX Taipei, demonstrates the first 450Mbps Dual Band Wireless N Media Bridge, model TEW-680MB. The 450Mbps Dual Band Wireless N Media Bridge networks computers, gaming consoles, televisions, and DVRs to the Internet with never before seen 450 Mbps wireless connection speeds. Four Gigabit Ethernet ports allow users to easily connect all networked media center devices to the Internet over a high performance network. Dual Band technology provides users the option of connecting media center devices to the common 2.4 GHz network, or to the 5 GHz network, which typically offers less interference from competing networks and wireless devices. A popular network configuration when connecting to a Dual Band router, such as TRENDnet's 450Mbps Dual Band Wireless N Router (model TEW-692GR), is to assign the low interference 5 GHz band to media center devices, and the 2.4 GHz band to computers and peripherals that are typically only able to connect using the single band 2.4 GHz frequency. An external Wi-Fi Protected Setup or WPS button connects this wireless bridge to a router at the touch of a button. Gone are the days of entering complicated encryption codes; simply press the WPS button on your router (most TRENDnet routers have a WPS button), and then press the WPS button on the TEW-680MB-the devices will automatically exchange information and connect over a secure encrypted wireless signal. WMM® Quality of Service (QoS) technology prioritizes gaming, Internet calls, and video streams. LEDs on the front of the adapter convey device status. "TRENDnet's 450 Mbps media bridge will be the third 450 Mbps wireless adapter that we launch to market," stated Zak Wood, Director of Global Marketing for TRENDnet. "This product affirms our performance and technology leadership position in the wireless category." The 450Mbps Dual Band Wireless N Media Bridge, model TEW-680MB, comes with a three year limited warranty and an MSRP of U.S. $169.99.